This flight experience consists of 15 minutes on the water, as well as a 10-minute instruction before your flight. 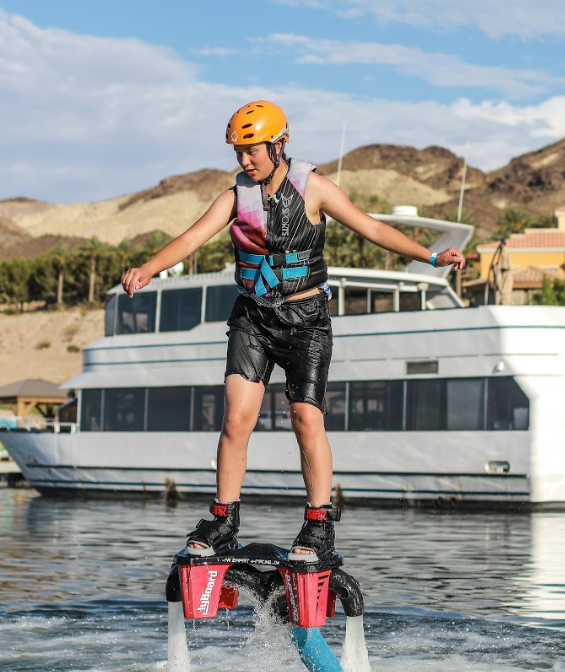 The Flyboard allows users to fly in the air above the water, through water propulsion. The Flyboard attaches to a Jet Ski through a 55-foot hose and the power of the Jet Ski is used to propel water out of the Flyboard. Though some people might refer to it as a water jetpack, the user is actually secured into the board by their hands and feet. When in the Flyboard, the user controls the navigation whilst the person driving the Jet Ski controls the power. When the Flyboard is attached to a Jet Ski, the Jet Ski has no steering. Flyboarding requires the user to manipulate the spray of the jets by tilting their feet.